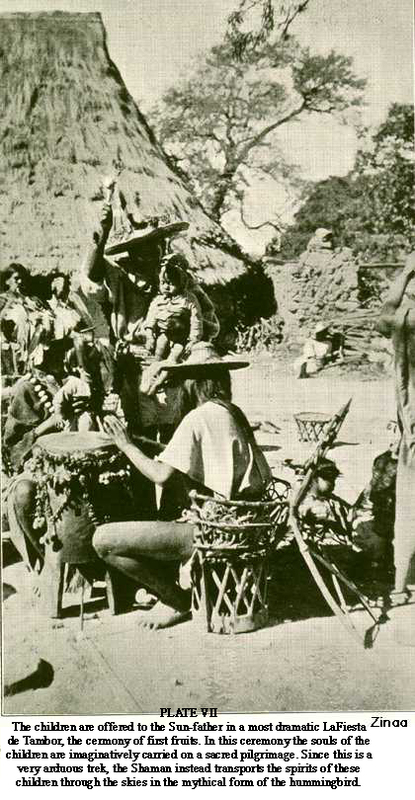 In this lesson students are presented with information to some of the beliefs and arts of the Huichol people of Mexico. Students are introduced to the concepts of cosmology/cosmogony and how these define and shape Huichol art. 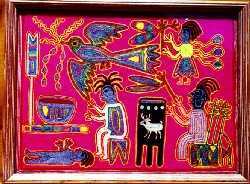 In the creation of nierikas (sacred, ritual tablets), Huicholes use symbols, patterns, and colors that are definitive of their cosmology. 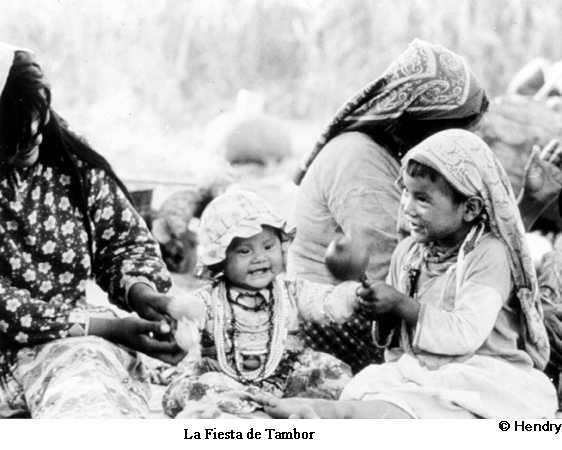 Again remind the students that for centuries the Huichol had no documented language. In the past decade textbooks written in Huichol are now available for Huichol children attending schools. Still most continue to communicate their history and thoughts to future generations through the stories they tell and the symbols they leave behind. Some of the most important images are deer, peyote cactus, corn, earth, sun, water, fire, and humans to name a few. 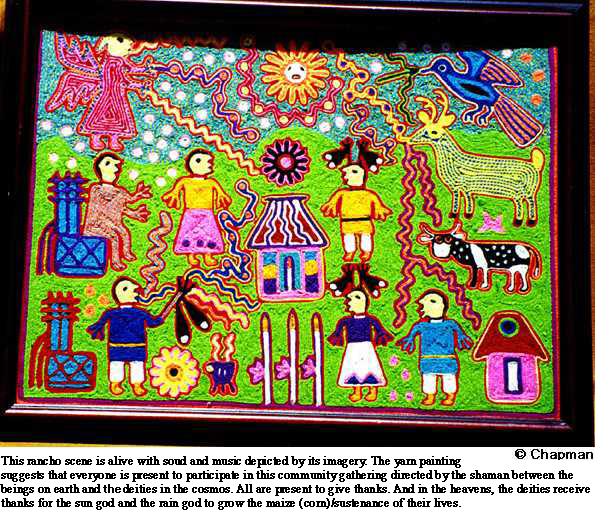 Huicholes create nierikas using a board (or clay tablet with a hole in the center) on which they coat a mixture of tree resin and beeswax to glue on elaborately colored yarn used to define their imagery. These objects are then left at sacred sites of the Huichol: caves, temples and springs. The imagery is based on their myths, stories, and personal activities of daily living. 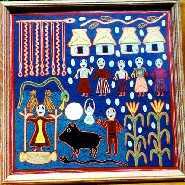 Yarn paintings are created in the likeness of Nierikas, but are used for commercial purposes, not rituals. Using their own experience (perspectives) and daily happenings, students will create their yarn paintings. ...the importance of knowing other peoples' history and cultural traditions because we can learn from these. ...the word cosmogony (kaws mah jen ee), means a theory or belief of a culture's origin of the universe. Cosmology is an explanation of the nature of the universe--how it is. This philosophical concept will need to be discussed to have meaning to the students. 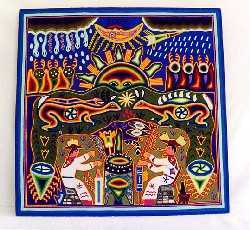 ...the Huichol cosmology defines humans as being connected to nature and all living things. This means that people depend on nature for survival. Explain that in the understanding of Huichol cosmology there are five directions. For the Huichol these five directions are, each of the four cardinal points defined by the western world (north, east, south and west), in addition the fifth is the spiritual, the source of enlightenment. This fifth point is the meeting of the four cardinal directions at the center, inclusive of the cosmos (heavens). 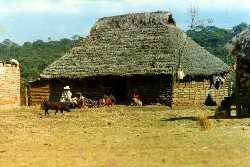 ...the Huicholes see themselves as caretakers of the earth. Their lives depend upon the earth and their sustenance from the maize (corn), beans and squash seeds they plant. 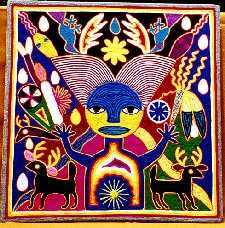 From the time they are children, the Huichol learn how to communicate with the spirit world through symbols and rituals to bring the rains and sun to grow their crops. Thus for these people all their artful expressions are meant as more than an aesthetic experience. Each yarn painting, beaded object, embroidery or act of music and dance is related to a part of Huichol tradition and belief. These become the material and expressive forms of the Hucihols' thanksgiving and prayers to their deities. ...the word painting, in reference to the use of yarn as the medium, may need to be discussed, as to its appropriate terminology. This is a good time to look at diverse perspectives of understanding within the class concerning the word painting. What is a painting? Do you need paint to make a painting? What art materials are used in a painting? Who were the first people to make paintings? Why do persons paint? What messages do paintings convey? Are all paintings meant just to be "pretty"? Who determines the worth and value of a painting? Is it correct to call a nierika a yarn painting? It is suggested that one goes to the Encyclopedia Britannica Online http://www.britannica.com and enter the word "painting" as a guide for the definition of this word. 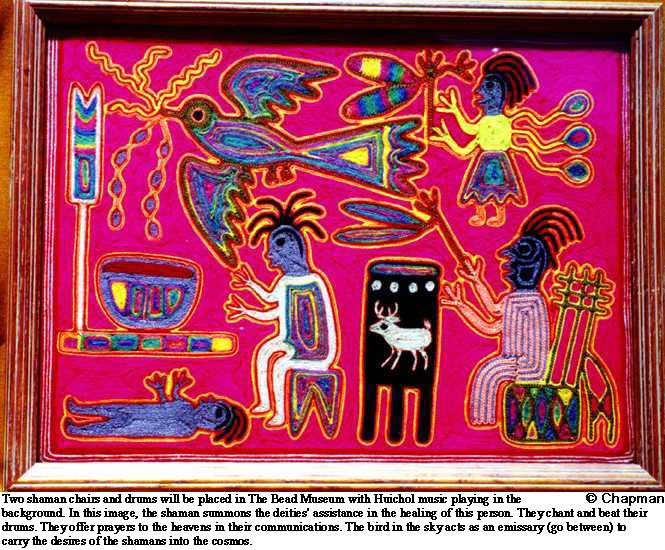 Huicholes use symbols throughout their art. These symbols refer to their cosmogonies (beliefs, stories and myths). By using symbols (the teacher may want to define the word symbol. give an example of a heart means love, etc. 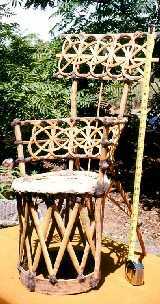 ), Huicholes create art to honor, preserve and balance nature and the world. Their art becomes the material objects, metaphors of their prayers, not mere decoration of a space. 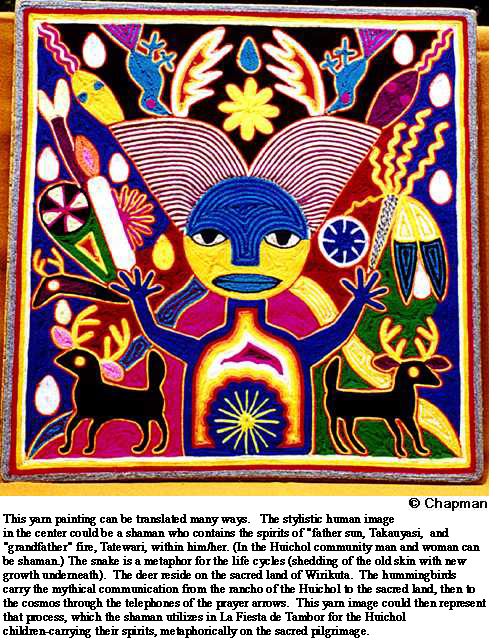 Huichol cosmogony defines the symbols, patterns, and colors used in their art. ...their own yarn paintings and collages using symbols to represent their important experiences and beliefs. ...use complimentary colors to create their artworks. ...recognizing that art making does not necessarily depict realistic/photographic scenes. ...referencing their own experience to create images depicted in their works of art. ...considering that their works of art have potential value in the community where they live. As an introduction to this art making process, present the art criticism lesson. Using one image of a yarn painting accompanying the lesson, have the participants look at the downloaded images mounted for easy viewing. Ask the students to describe what they are viewing. What materials are used to make this art object? What are the colors and designs in the artwork? How was the art object made? Ask them to analyze the art work by stating who they think made the art; the culture it was created in; and the purpose for the artwork. Continuing to analyze and interpret the art work: What do the colors represent? Why were they chosen? How is the space arranged (is it symetrical or asymetrical)? Ask them to record whether this art object might have any significance in the creators lives, or to the students/ What is important to these people in general? Have the students share their answers. At the completion of the art making activity, ask the participants to state what new information they have learned in these same areas of questioning. Then, show the students the other examples of yarn paintings illustrated on this web site. You may want to start with images that are "easier" for the students to decipher. For example, you may want to use the ones depicting the life of the Huicholes at the rancho. (Locate the environment of the Huichol on the included map.) Ask the students what they see. Some answers are people, corn, and a variety of farm animals, rain, and the sun to name a few things. Tell the students that the Huicholes are inspired by the everyday activities that are necessary for survival, and the images used to convey ideas are not always realistic. Discuss the use of the word cosmology to describe the philosophy of these people's lives. Have the students discuss how this way of thinking may be different from their own. 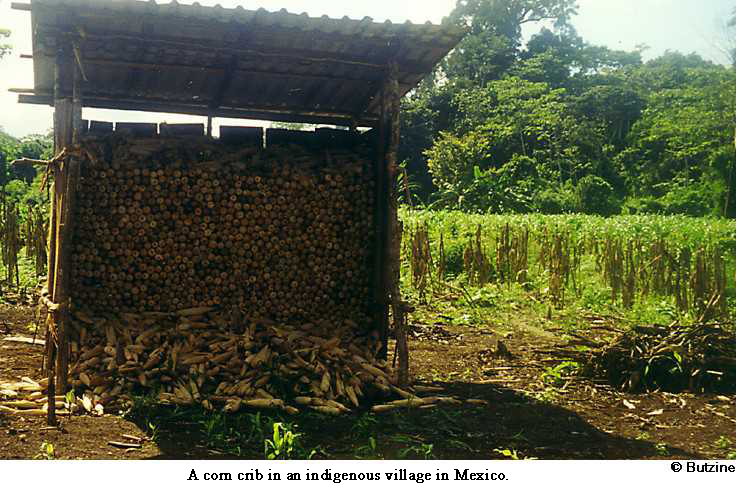 Again relate the understanding that Huichol survival is about the three-parts of the self: physical, emotional and intellectual (culminating in the spiritual) all tied to the growing of their crops (as it is in most agrarian societies around the world). You may later want to show the students the yarn paintings that contain more elaborate images that accompany this lesson plan. Discuss the symbols in these yarn paintings (nierikas) and how they are a means of communication, since until the past decade the Huichol people had no written language. Have students list information about their daily happenings that are important to them. 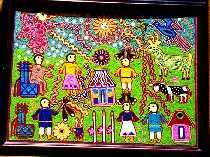 Have them also consider what are some of the special events they may want to depict in their own yarn paintings using symbols from their lives to convey a story. Have the participants begin making sketches. Using small pieces of thick cardboard, foam board, or plywood board (The Huichol create their yarn paintings on a piece of plywood that has been framed off underneath with their plywood strips), have the students lightly sketch their images with a pencil, and have them put their name on the back. Use bushes to put a light amount of glue (Elmer's glue, a mixture diluted of two parts glue, one part water) onto the areas where the students will first work. 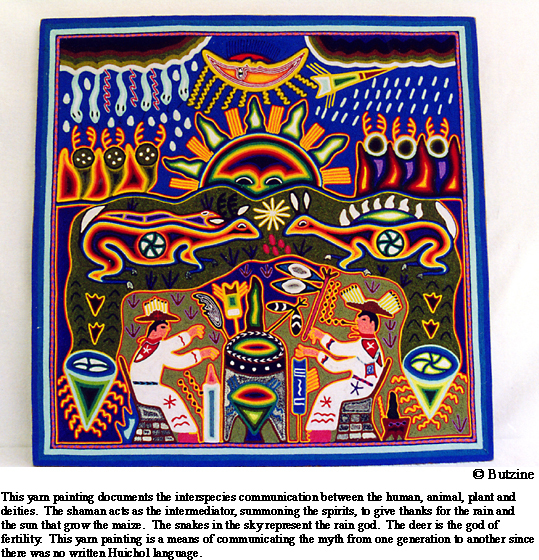 Discuss with the students that the glue used by the Huichol comes from nature. (It is a mixture of tree resin and bees wax.) 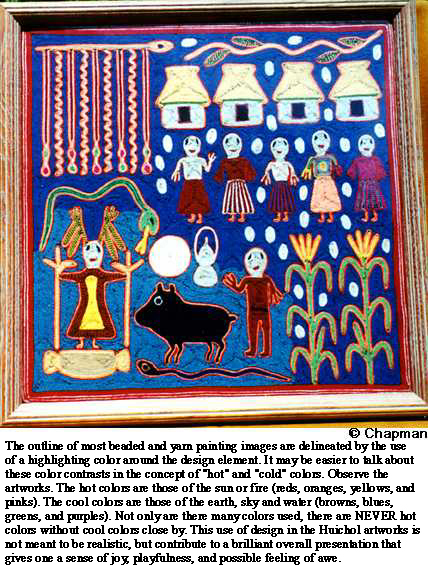 (Huichol artists first border their paintings with three different colors of yarn - note accompanying images.) Cut the pieces of yarn into workable lengths, so that the yarn does not get tangled or full of glue. Tell the students to next start winding their yarn in the middle of the various images (use a Q-tip to press the yarn into place). But first outline the image in a contrasting (complimentary) color. This use of different colors of yarn gives a vibration (halation) effect. Have the students view the yarn paintings again to observe the use of color by the Huichol artists. The students continue to cover the entire area of the board so that nothing is showing through, noting that color choice of yarn in these examples is not necessarily realistic. Described on one of the yarn paintings is information about the design concept of contrasting (complimentary) colors- a "hot" color next to a "cool" color. This method of color placement helps the image to stand out from the background. Have the students imagine a sunset and describe this kind of color combination and the resultant visual effect. After the participants are finished covering the entire board, lay the yarn paintings out to dry. Reinforce the idea that many artists incorporate things that are important and special to them in their compositions. This not only means images, but small trinkets from nature's refuse or civilization's trash. These additional objects give the final artwork a more significant meaning when the objects represent a metaphor for a personal idea or value. (Define what metaphor means.) Students may also choose to incorporate personal trinkets or pieces from nature into their composition. Have the participants talk about what they created with their peers. Exhibit the yarn paintings outside the classroom. Have the students complete an acrostic writing using the word NIERIKAS Keep it simple for the younger age children. Sentence fragments may be written by older youth. Have the participants write a paragraph about what they learned from this activity, either from another culture's perspective about life or about the art making activity itself. A rubric could be applied with values from 1-5, for the art project. The student participates in the beginning of the lesson, but is unable to put anything into form. The student is only able to get a basic sketch onto his/her cardboard or plywood section. The student begins the artwork in yarn, but does not complete it. The student is able to complete the fabrication of the art project as directed, but is unable to reflect on its meaning. The student completes the art project and is able to explain his/her artwork to the group in the context of the art history component of this lesson. For the younger students the folktale in the book, The Eagle and the Rainbow by Antonio Hernandez Madrigal, could be read aloud before the activities begin. For the youth of about eleven years and older the book, So Sings the Blue Deer by Charmayne McGee, is an excellent selection. 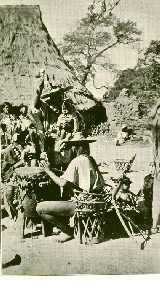 Both texts will give the participants a better idea of the lives and culture of the Huicholes. The Bead Museum in Glendale, Arizona, will feature an exhibition of the Huichol beaded, textile and support art objects that are seen in the images of this unit. A field trip to the museum would be a means to reinforce this lesson plan and continue to explore the significance and value of the understanding of the Huichol culture in our lives.